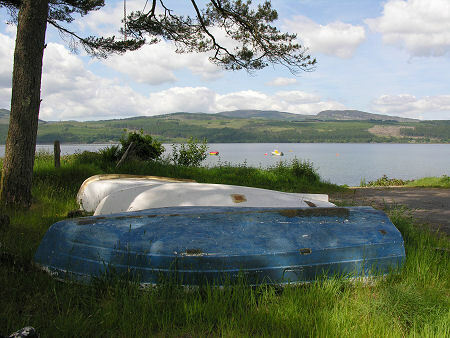 Strachur lies on the east shore of Loch Fyne and continues a little way inland along the A815, the road that crosses the Cowal Peninsula via Loch Eck and the end of Holy Loch to Dunoon. The pass followed by this road has throughout history formed one of the easiest routes across Drumalban, the spine of mountains which for long periods in the early historic era formed a boundary between the Scots of Dalriada to the west, and the Picts of Pictland or Pictavia and Britons of Strathclyde to the east. The village was originally called Kilmaglas or Kilmoglash apparently a corruption of the name of the early church here, Kilmolash, or "Church of St Molaise". The name "Strachur" seems to come from the Gaelic "strath cor" and probably means "twisting valley": though an alternative interpretation would see it originate in the Gaelic for "the glen of the heron". 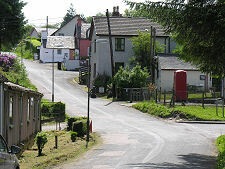 Equally unclear is when the name Strachur began to be applied, and why Ordnance Survey maps name the village as Clachan Strachur. 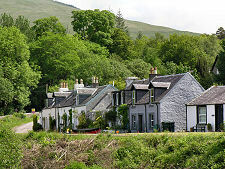 The original heart of the village lies just off the A815, half a mile inland from Loch Fyne. 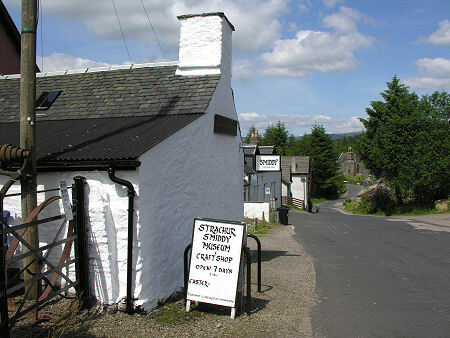 Here you will find the Smiddy Museum and the Clachan Inn, plus newer housing built by the Forestry Commission for staff working in the Glenbranter Forest, stretching away to the south east. The forest also accounts for the sawmill in the village. 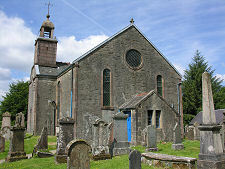 The inland part of the village is also home to the attractive Strachur Parish Church strikingly placed within its oval churchyard on the far side of a small valley. Much of the structure of the church dates back to 1789, though many of the details and most of the interior come from major renovation in 1903. Outside the church it is worth looking out for the 11 tapering grave slabs dating back as far as the 1300s that have been set into the outer wall. 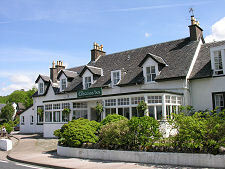 Downhill from the original village, the main road brings you to the shore of Loch Fyne. Nearby is Strachur House, built by General John Campbell in the 1780s, though added to over the years since. 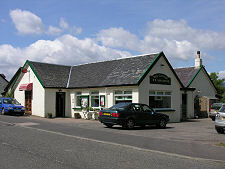 There are also more houses and a shop here overlooking Strachur Bay. 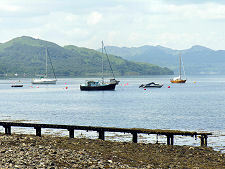 The bay was where local farmers and fishermen worked to build their own pier to allow steamers to service the village. By the early 1900s, tourism already played an important role in the local economy. The "Loch Eck Tour" involved passengers disembarking from steamers at Dunoon before travelling by carriage along Loch Eck, then meeting another steamer for the return journey to Glasgow at Strachur, or going on to Inveraray to meet a boat there. These tours still took place as late as the 1960s, though by then the horse drawn carriages had been replaced by coaches. 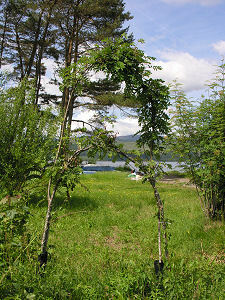 When we first produced this page following a visit in 2002 we remarked on a pair of rowan trees near the shore of Loch Fyne, whose branches intertwined to form a circle. 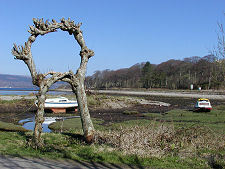 The pair had been carefully moved to their lochside location to make way for a nearby road improvement scheme in 1994. A return visit in 2009 found the original rowans sadly gone, though two nearby saplings were being trained up to replace them. Just north of Strachur on the coast of Loch Fyne is Creggans. This was for many years the site of a ferry across the loch, but no longer. 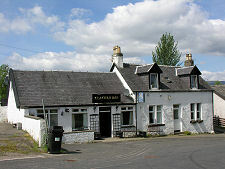 Today it is better known as the home of the Creggans Inn. From 1962 this was developed by Sir Fitzroy Maclean (whose exploits helped inspire Ian Fleming's character of James Bond) and later by his son, into an excellent small hotel.